Think of it as your motor home for the ocean. Hewescraft designers spared no detail when equipping our Pacific Series cuddy cabins. Built on our renowned rock-solid hulls, we’ve created a vessel that is a cut above the typical fishing boat. 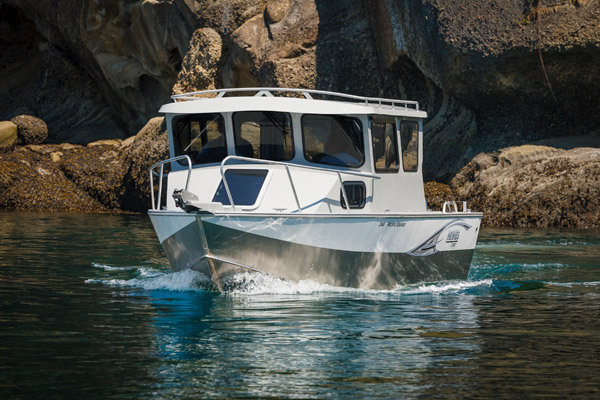 Sure it still has all the terrific functionality that Hewescraft’s are known for: large fishing decks, plenty of storage, high sides, stable ride, exceptional safety features, and more. But with the Pacific Series we’ve added stylish creature comforts that will make you feel like you never have to go home because...well, this boat feels like home. Some of the features you’ll have to see to believe: best-in-class walk-through cuddy hatch, spacious V-berth sleeper with upright seating; dinette that converts to a bed; galley with stove/heater combo; stand up/sit down pilot seating; mid-length cabin with marine head (on 260 only). Ask Dewey's about our recently released 26' Explorer with self-bailing and 8’ bottom. One look at our strong welds, cabin construction, and immense storage, and you’ll quickly see why we believe buying a Hewescraft means getting a lifetime boat from a lifetime company. 24' Pacific Cruiser w/Dinette & Galley Yamaha F115 4-Stroke Spec. EZ Loader Trailer Spec. Beam 102" 1.8L Weight 1995 lbs.